New York Police Department wants Waze to stop revealing DUI checkpoints | Car News, Reviews, & Pricing for New & Used Cars. “Police reported ahead” is a common phrase heard on a drive using the crowd-sourced navigation app Waze. Added to the app in real time by nearby users, it’s one of numerous alerts sent to drivers about upcoming obstacles on a route. Many users view it as a harmless way to avoid getting speeding tickets, but others use the app to point out police checkpoints, including those setup for DUI prevention. The New York Police Department (NYPD) wants it to stop. 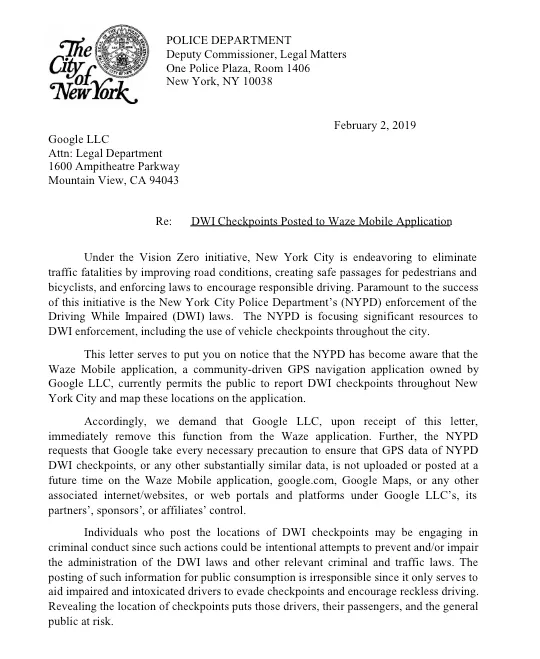 Written about by the The New York Times and reported by Streetsblog, the NYPD sent a cease-and-desist letter to Waze’s owner, Google. It insisted the app’s capabilities should not be allowed and could even be considered illegal. “Individuals who post the locations of DWI checkpoints may be engaging in criminal conduct since such actions could be intentional attempts to prevent and/or impair the administration of the DWI laws and other relevant criminal and traffic laws,” NYPD Deputy Commissioner for Legal Matters and lawyer Ann P. Prunty said in the letter. By design, Waze is not directly at fault, as the application does not have a feature that specifically calls out checkpoints. However, once the police alert is selected, users can then add custom details about why the police are in that location. Waze also has functionality to call out speed cameras. “… informing drivers about upcoming speed traps allows them to be more careful and make safer decisions when they’re on the road,” Google stated, adding that safety is of upmost importance. Previous articleIs the Gocycle GX the perfect e-bike?